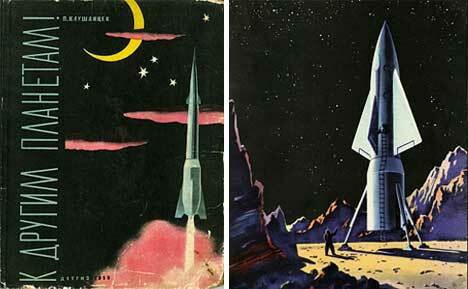 In the 1950s, the space race was in full force. 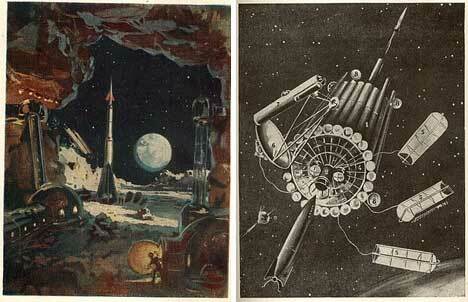 The US and the USSR were both dead-set on being the first to put a man on the moon, and then to colonize the moon. All through the 50s and 60s it seemed like we were just within reach of living in space. 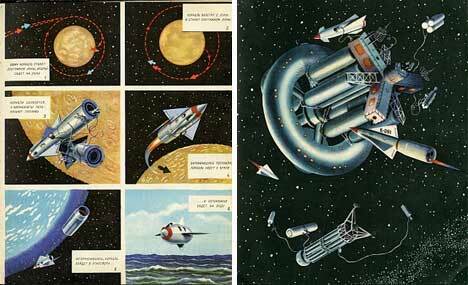 While the actual future (which would be our present) didn’t turn out to be nearly as glamorous as we expected, we can still look back fondly on these vintage Russian space illustrations and feel the wonder that kids (and even adults) must have felt as they were told that we’d be living in space within their lifetimes. In this book, To Other Planets, author Pavel Klushantsev explains how mankind will blast off from Earth to hang out on futuristic space stations or take a quick trip around the moon. 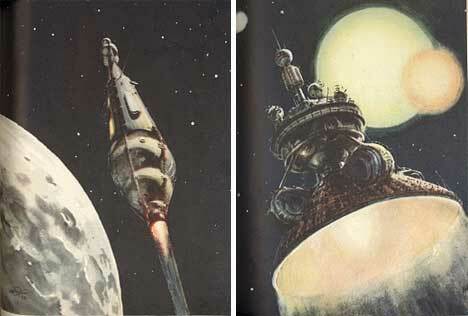 The illustrations are marvelous, and the imaginary spacecraft aren’t too terribly far-off from the machines that actually have made it into space since then. 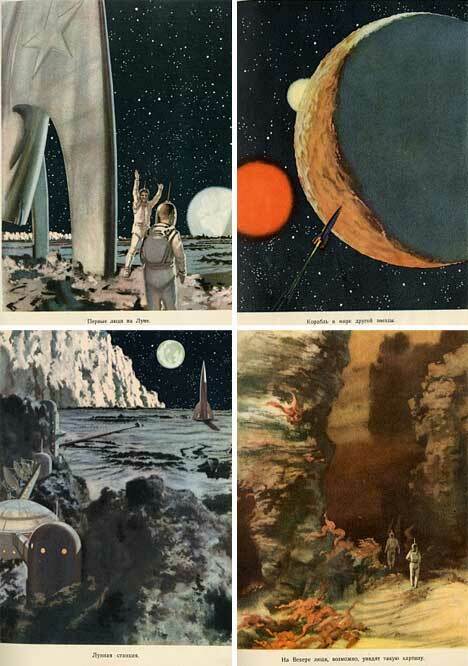 These illustrations by A.S. Sysoyev, N.V. Shchelznyaka and N.M. Kolchitskogo were taken from a book called Journey into Cosmos. The rockets in this book were perhaps a little more fantastical than the ones above, which goes to show just how wide-open space travel was at that time. Anything was possible and nothing was set in stone, because we were still exploring and figuring out how to overcome the obstacles keeping us from space. By 1956, when Discovery Peace was published, it was pretty much decided already that humans would be landing on the moon; it was just a question of when. And everyone, from the experienced astronaut to the curious schoolchild, was convinced that we would soon travel well beyond the moon. An entire generation of children grew up believing that we would be living in space colonies by the time their grandchildren were born. Sadly, we haven’t quite reached our full space potential, but as long as humans are capable of dreaming about distant worlds, we’ll keep striving to reach them.